Thoroughly revised and updated, the second edition of Managing and Measuring Performance in Public and Nonprofit Organizations is a comprehensive resource for designing and implementing effective performance management and measurement systems in public and nonprofit organizations. The ideas, tools, and processes in this vital resource are designed to help organizations develop measurement systems to support such effective management approaches as strategic management, results-based budgeting, performance management, process improvement, performance contracting, and much more. The book will help readers identify outcomes and other performance criteria to be measured, tie measures to goals and objectives, define and evaluate the worth of desired performance measures, and analyze, process, report, and utilize data effectively. 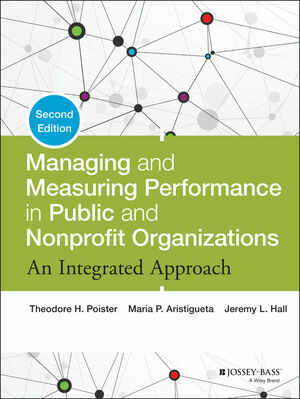 Managing and Measuring Performance in Public and Nonprofit Organizations identifies common methodological and managerial problems that often confront managers in developing performance measurement systems, and presents a number of targeted strategies for the successful implementation of such systems in public and nonprofit organizations. This must-have resource will help leaders reach their organizational goals and objectives. THEODORE H. POISTER is professor of public administration in the Andrew Young School of Policy Studies at Georgia State University. MARIA P. ARISTIGUETA is the Charles P. Messick Professor and director of the School of Public Policy and Administration at the University of Delaware. JEREMY L. HALL is associate professor at the School of Public Affairs and Administration, Rutgers University-Newark.